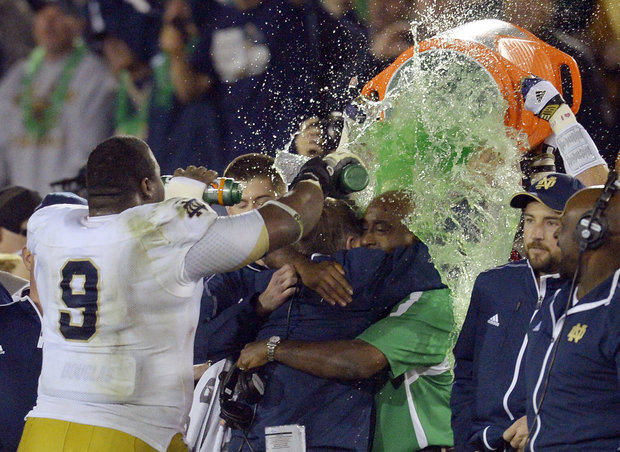 Irish Coach Brian Kelly gets a shower after cliniching a trip to the Championship game. 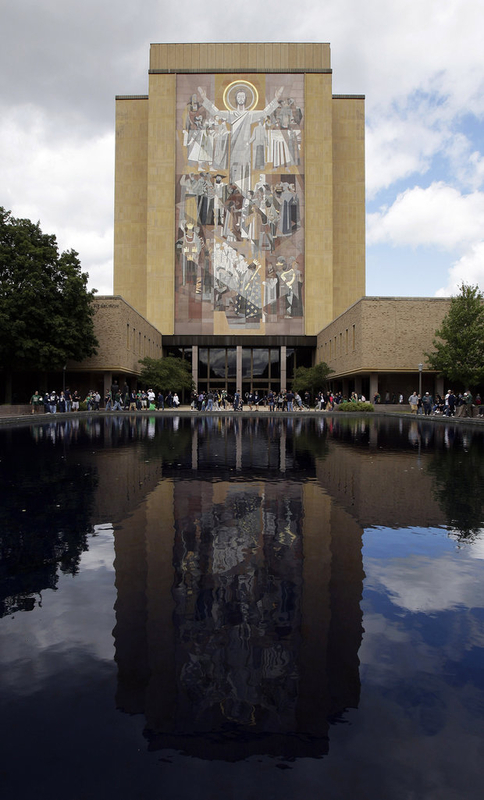 'Touchdown Jesus' mural can be seen from ND stadium. If you want to spark a heated discussion in college sports there is one team that seems to top most other schools — Notre Dame. Last weekend the Fighting Irish finished an unbelievable regular season beating USC on the road and finishing with a 12-0 record and one more game to play. That game will be for the BCS title on January 7 in Miami. Their challenger for the National Championship will be determined in a few days. For now, it is the team from South Bend, Ind., that is making the headlines and stirring the conversation. Years ago, two words seemed to get under the skin of many people about Notre Dame: Irish and Catholic. For some reason it made the school seem very segmented and is a "turn-off" to a significant number of individuals. It seems that was the genesis of the distain that has evolved into just viewing Notre Dame as pompous and very arrogant. They have for a long time had their own lucrative national television agreement. In the crazy collegiate world of big NCAA conferences expanding, Notre Dame&apos;s football program refuses to budge in joining them and still remains independent. (The rest of their sports programs are in conferences). Right now, that decision looks pretty good. They don&apos;t have to share their football revenues and money will flow in South Bend as they march on to the big title game. Chicago has always laid claim to Notre Dame as being part of its realm. It is a short drive from downtown and there are a multitude of alumni that live and work here. Full disclosure, the only vacations I ever took as a kid were to South Bend to stay with my godparents. In fact, we were just there on Saturday, hours before the game in California. It was the first time my son got to see the famous campus and field — and of course "Touchdown Jesus." For those that don&apos;t know what that means, there is a huge mural of Jesus with his arms extended like a referee signaling a score visible at the stadium. When we were there this weekend, strangers had no trouble walking up to me asking what I thought about the "big" game that day. In this small town, Notre Dame is everything and to the rest of the country it is a big deal, too. The next several weeks, the stories about this tradition-rich school will fill sports pages and airwaves. Love them or not — the ascension to the top of the college football world has been fascinating. Before the season began the AP pre-season poll (voted by sportswriters) did not have the Irish in their top 25 rankings. The coaches voted them 24th in the USA Today pre-season poll. How dumb they must all feel now? The start for a perfect season began overseas, at where else — Ireland — against Navy. They followed by beating three Big Ten schools in consecutive week: Michigan, Michigan State and Purdue. The ride to the national championship had two exciting overtime wins: one against Stanford and a triple overtime win against Pittsburgh. The lovers of Notre Dame will say they are a team of destiny, the ones that don’t care for them will say it was just luck. Either way, you can’t deny head coach Brian Kelly (in only his third year) has pushed all the right buttons, even though his seniors were recruited by predecessor Charlie Weis. The team&apos;s biggest star isn’t Irish, isn’t Catholic, but a Mormon from Hawaii — Manti Te’o. Last year the senior linebacker could have opted for the NFL but he stayed and has dominated. Te&apos;o is being considered for the Heisman Trophy and is a finalist for the Maxwell Award. Next spring the Notre Dame defender will likely be a high first round pick in the NFL. If this team from South Bend is going to win the title, it will be a red-shirt freshman Everett Colson guiding the team at quarterback. There are bountiful stories to tell leading up to the big game on January 7. And if the Irish win, there will be lots of stories forever. After all it is Notre Dame, like it or not.